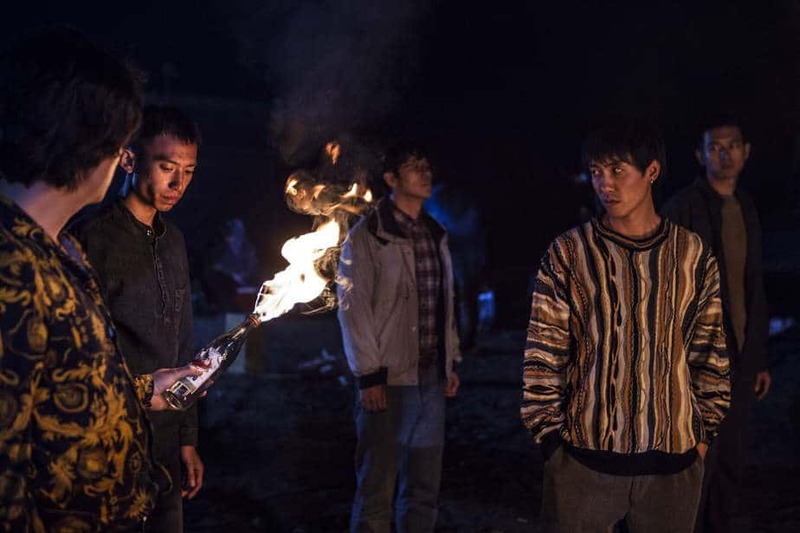 The first feature of the Chinese director Song Wen, “The Enigma of Arrival” enjoys a world-premiere at the 23rd Busan International Film Festival. What better Festival than the Korean one to introduce this very auteur and arthouse movie? The film starts with a dinner-meeting in what seems to be a very Japanese house/onsen. Four men gather and an altercation arises. Despite the voice-over, the spectator is still as confused as at the beginning of every “Law & Order” episode. The time, place and characters aren’t really clear yet. Little by little, we understand that the four men actually used to be close friends. They met a girl, Dongdong (played by Xuan Gu). The girl disappeared. The main character, Xiaolong (played by rising actor Li Xian) is willing to do what it takes to find out the truth. The group dismantles slowly. At first, the film may look like it is an investigation movie. We do know what happened to Dongdong, but it actually isn’t the main point of the feature. It is to have a look at the lives of four friends whose bond dissolves, to look at the effects of unspoken things and to look at men growing up. That is why there is a touch of nostalgia to the 2018- feature. The movie director, Song Wen, is the founder of the FIRST International Film Festival Xining. The event aspires to present movies that question cinema as an art. It then makes sense that “The Enigma of Arrival” is doing exactly that: questioning cinema, in its form and in its content. The film offers beautiful and amazing images, alternates colour and black and white scenes, long shots, medium shots, close-ups. Song Wen plays with images, and, if it sometimes lacks a little bit of coherence, cinephiles enjoy it. The question of subjectivity in life (and, to some extent, to movies), is also raised several times. The voice-over of San Pi (played by Liu Weibo) actually gives the tone of Wen’s first feature right from the start when he states: “Life is floating between fiction and reality like a prism”. It is also noticeable when we discover the perspective of other characters and when Xiaolong looks directly into the lens of the camera. Li Xian’s acting is not flawless, but the charisma and intensity of the actor make it up. Xuan Gu’s, for her part, manages to stay mysterious as we never really know how she feels. All performers make their characters likeable, human and believable, which is the most important. In conclusion, “The Enigma of Arrival” lacks a little bit of coherence and sometimes get lost in its own artsy-ness. Nonetheless, it raises interesting points, gives a valuable touch of nostalgia and should be watched more as art than as pure entertainment.